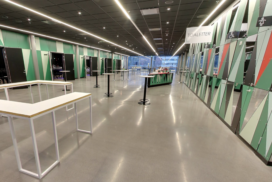 The Candela foyer is a large area of no ​​less than 352 square feet, used primarily as a mingling area for larger conferences or exhibition space at major tradefairs. The venue is extremely flexible and airy for larger groups regardless of the project or event you have in mind. Candela foyer is most often used together with Lindholmen Conference Hall, where larger groups can launch events or banquets with a glass of champagne in the Candela foyer. Some champagne to start the event with?